Transformation: The Miya Kaadadjiny garden. WHAT was once drab high school land in Girrawheen is lifeless no longer. 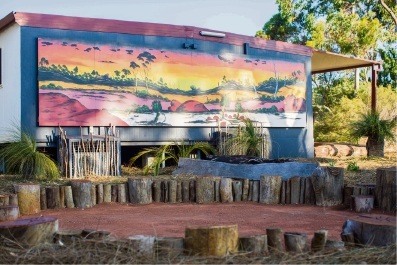 Girrawheen Senior High School students in collaboration with the Girrawheen Clontarf Academy have spent months transforming a dull space into a community garden on school grounds. Principal Rosalba Butterworth said the garden, named Miya Kaadadjiny (learning sanctuary), would be treasured for years to come. “I’m immensely proud of what has been achieved here,” she said. The students partook in a design workshop to discuss the use of the space before working with local environmental group Replants to relocate grass trees, logs and natural |elements from nearby LandCorp project Blackmore Park Estate. LandCorp metropolitan general manager John Hackett explained the developer assisted with the community garden as one of its urban |regeneration projects. “From the recycling of materials on the former Blackmore Primary School site, to sharing landscaping and design expertise, this project is not only an example of a successful community space but also how we can work together,” he said.